Congrats to all of you out there who attempted NaNo, whether you “won” or not. Have you spent the first week of December sleeping for days on end? Drowning your sorrows in gingerbread lattes? Or maybe just having a good veg day? Regardless of how you’re recuperating, I hope you’re also thinking of how to move forward with your completed manuscript. This post is for those of you who want to take their NaNo novel to the next level. Hey, I get it. I’ve attempted NaNo three times and only won once. I don’t think a 33% success rate (or lower) speaks to our lack of dedication, but rather to an excess of responsibilities that precluded us from writing a novel in a month. NaNo is an extreme challenge, after all, which is why we honor those who win it. What I’d suggest is that you DO NOT, FOR ANY REASON, GIVE UP. Just because you didn’t write your novel last month doesn’t mean you can’t work on it now. Think about it — you have more words than you did before the challenge. You’re at an advantage to all of those just floating an idea for a novel around in their heads. Be diligent. Identify regular writing days and times in your calendar. Schedule them in your iCal or your planner. Write when you’re passionate. Write even when you don’t want to. Write when you’re exhausted. When you’re jazzed. Before you go to work. Before you go out. Before you know it, you will have a completed first draft of your manuscript, and you can move on to join the winners in the next section. Next Steps… If You “Won” NaNoWriMo. First off, congratulations! This is huge. You are a novelist! The owner of a shiny, beautiful first draft containing at least 50,000 words. Though you should be proud, please also be aware that your manuscript has a ways to go at this point. This is because NaNoWriMo privileges first draft strategies that lead to a maximum word count. If you couple this with pantsing instead of plotting or a lack of outlining/prewriting, this means that you’ll end up with some elements that need to be cut and other elements that are in desperate need of being built out. These are typically superficial elements of the novel. For instance, you may find on a second read-through, that your descriptions are bulky or that you tell more than you show. When you’re cranking out a first draft, you often don’t have time to question your characters’ decisions or to wonder if a certain plot point is logical. Whether your characters walk on water, whether one is armed to the teeth while others are empty-handed, or the gardener sleeps with this character instead of that, there may not be reasons beyond tautology (“they do it because they do it"). You may also notice a lack of character development. Does your protagonist change as a result of the experiences they undergo, or are they largely the same person at the end of the book as they are at the start? Before you launch into editing, though, I recommend taking a few days away from your novel to build an objective distance, then reading back through it. Take notes like a third-party observer as you go. This is one of the editing tips that I recommend in my new e-book, Your 15-Day Editing Game Plan, which launches today. 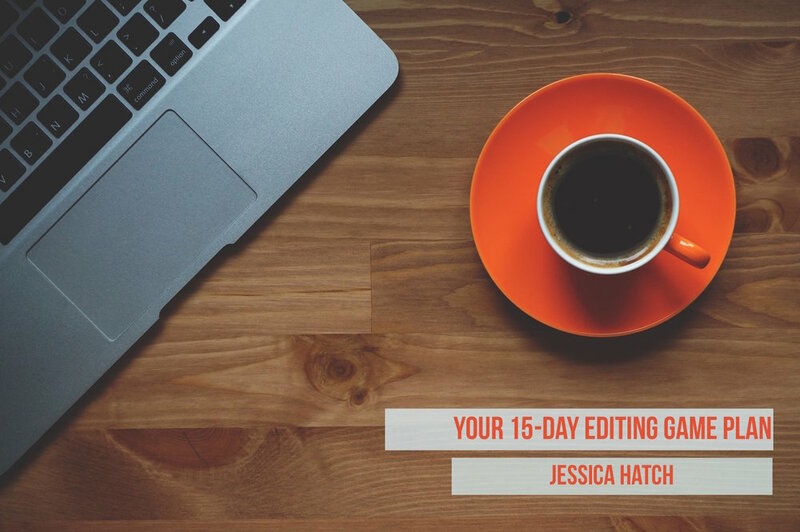 My game plan will coach you through a two-week editing preparation session. The exercises and questions inside the book will move you from the purely creative mindset of a writer to the problem-solving mindset of an editor. Check it out, and let me know how your game plan shapes up!